The House Intelligence Committee’s investigation into Russian election hacking has been a bad joke from day one. But now it’s just getting sad. Chairman Devin Nunes recused himself from the investigation in March after admitting to a secret, late-night rendezvous with White House staffers (though, not before he was caught lying about it to a Bloomberg reporter). Yet his apparent fierce loyalty to President Trump continues to override his better judgement. In a letter obtained by CNN on Wednesday, Nunes threatened to hold Attorney General Jeff Sessions and the new FBI director, Christopher Wray, in contempt if they failed to cough up information on the notorious Steele dossier subpoenaed by the committee last month. 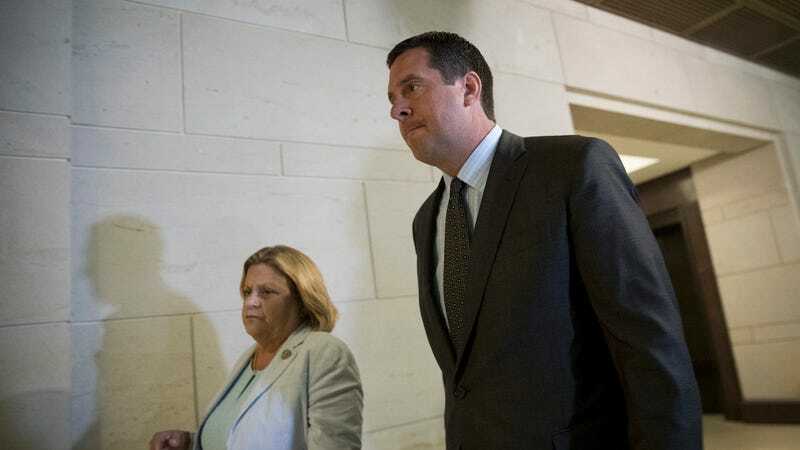 Nunes added that if the DOJ and FBI failed to show up to testify he’d reserve the right to report a resolution to the House “to hold the Attorney General and Director of the FBI in contempt of Congress,” a misdemeanor punishable by up to $1,000 fine and one year in jail. While, supposedly, Nunes is no longer involved in any Russia-related matters, members of his committee—and the Republicans in particular—have issued multiple subpoenas seeking documentation that might show whether or not the Justice Department is relying heavily on the Steele dossier (that’s the one about the pee tape) while investigating potential collusion between the Trump campaign and the Kremlin. That investigation includes the Russian-attributed hack of DNC emails and communication between Trump administration members and Russian interests. The Guardian revealed early last month that one of Nunes’ longtime aides secretly dispatched two congressional GOP staffers to London in hopes of locating the dossier’s author, former British intelligence agent Christopher Steele. While a committee spokesperson claimed the trip was official business, its leading Democrat, Adam Schiff, told reporters he hadn’t been notified beforehand. Trump allies have been eager to attack the document, which alleges that Trump has, over a period of years, fallen under the influence of the Russian government. Commissioned by the Washington-based strategic intelligence firm Fusion GPS, the Steele dossier was never intended for public consumption—much of what it assert may not be provable. Demonstrating that Special Counsel Robert Mueller’s investigation relies heavily on such a questionable document would likely go a long way in helping the Republicans publicly discredit his findings. While it is illegal to work for two branches of the government, Nunes appears motivated far less by his duties as a congressman and more by a desire to ingratiate himself to the White House. Even prior to stepping aside, he frequently and blatantly tried to derail the investigation by indulging Trump’s patently false claims about illegal wiretapping at Trump Tower—an accusation that now even his own Justice Department has come out against. During a series of impromptu press conferences on Capitol Hill in March, Nunes repeatedly mischaracterized the process by which the names of US citizens are unmasked in intelligence reports. His apparent goal was to implicate Obama administration officials in needlessly targeting Trump allies. The day after White House attorneys leaked Nunes’ classified documents, Trump told reporters he felt “somewhat” vindicated in alleging illegal wiretaps—even though the documents showed nothing of the sort. This is what Nunes chose to do with his time instead of investigating whether or not a foreign adversary had attempted to manipulate US voters through a series of cyberattacks during a presidential election. Nunes’ fealty to Trump has never been in doubt. As a pivotal member of the Trump transition team, he’s said to have handpicked Marine Corps Gen. James Mattis for defense secretary and further helped Republican Rep. Mike Pompeo secure his post as head of the Central Intelligence Agency. What’s more, he helped raise at least $1.3 million for the Trump campaign last year; efforts that appeared to have been rewarded with a ride on the then-candidate’s private jet. It seems Nunes’ voluntary recusal has had little impact on his ability to interject himself back into the hearings whenever he pleases.